Place cauliflower and mushrooms in a large bowl. Place over slices of tomato. Mix milk with cornstarch and boil. Stir constantly until it thickens, remove from heat and allow to cool for 5-10 minutes. Then add the beaten eggs and yogurt and mix composition. Add salt and pepper. 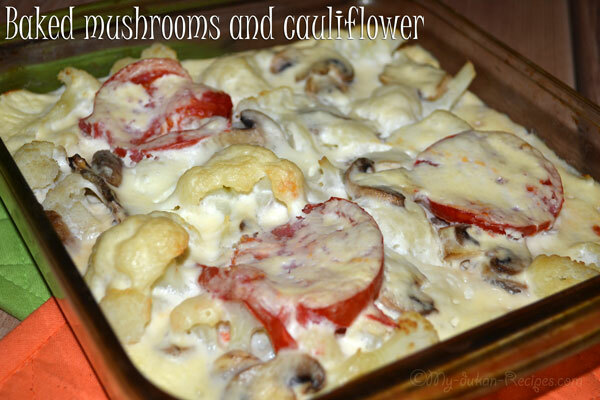 Pour the mixture over cauliflower and mushrooms in the dish and bake it for about 40-45 minutes. If you are not on a diet, replace yogurt with sour cream and add the grated cheese on top before placing in the oven dish .